There are brokers that we want to make sure we introduce properly thou they at this current time are not offering crypto for trading. I expect this to change in the near future and as such this regulated forex broker that offers multiple trading platform has to be among the top brokers. 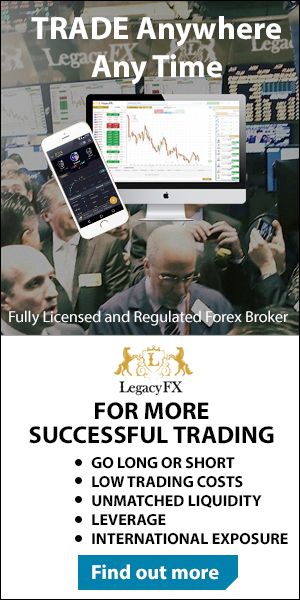 LegacyFX is a regulated forex broker that offers its trading services under the license of Cysec. They acquired this regulation not long ago and i find that many reviews today still did not bother to update this, we try to remain accurate and as such checked with Legacy FX if this is correct. They clearly stated they are fully regulated and thus also require doing full due diligence on their traders to make sure that there is no money laundering going on. In this LegacyFX review will touch the most Important aspects of a Forex broker. When you plan to trade forex, But in the end is important is are trading conditions in how much it cost you to actually tree. Are you being put in a position to be successful. And before we go into more details. I will tell you that for traders is that look to become better traders and look to increase their knowledge and skills, LegacyFX is one of the better options out there. You will find this is not one of the cheaper brokers. They are a little bit heavy on the spread and opening an account is more than your average $100 but goes towards the $500. Legacy FX go on the assumption that someone who is putting $100 is not really a trader, and i tend to agree with this assumption. If someone wants to check their system, they can simply open a full service demo account and check their trading platforms this way. The broker offers a few trading platforms, you have of course the metatrader 4 trading platform. This platform has defined the market for the last 10 years and will keep on doing so i expect. But they also offer, and this is the more interesting one the Metatrader 5 Trading Platform. all traders slowly will go from metatrader 4 to metatrader 5 and they are just ahead of the curve. the metatrader 5 is just an upgraded version of the MT4 and traders that are trading on the MT4 will get used toit very easily. Multiple trading platforms to cater to traders of all levels. The option for social trading. They are somewhat on the pricey side. Relatively new to the market. All in all legacyFX Forex broker is proven solid trustworthy. Forks program that allows traders to trade, according to their level. They offer everything you need at a traitor to be successful. Their educational package is second to none in the customer service is off the highest level.